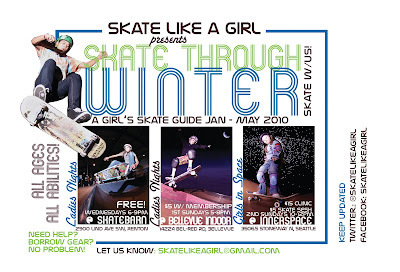 2010 is a great year for Skate Like a Girl! 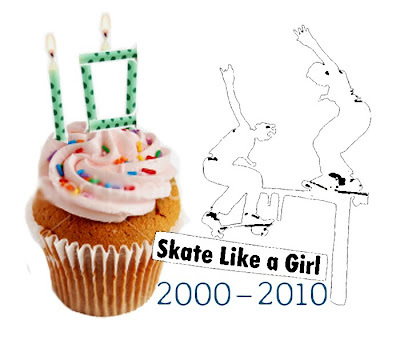 2010 is our 10th Anniversary, and it's been an exciting start: Skate Like a Girl is an official 501(c)(3)! What does this mean? We can have more ways of supporting our programs through grants and generous donations from our supporters. Our February Challenge is to get 1000 individual donations ---this can be any amount! Our February challenge is asking Facebook, Twitter, Myspace friends to help get over 1000 or more fans / followers of Skate Like a Girl to donate any amount to our Firstgiving account (www.firstgiving.com/skatelikeagirl). For the month of February those who donate more then $40 will get a new Skate Like a Girl shirt by the end of 2010. Funds help us support free and low cost programs: Seattle Programs for February - May 2010! As well as help us provide financial support to all three chapters! Below you will find: a recap of what we are up to and what we are planning for in 2010. Skate Like a Girl supporters met our January challenge of raising $1000 in 3 days! We are also working on a new website with the help of Jennifer Pearce that can serve as an online resource. Let us know if there are features that you would like to see! Shannon Monts, Chair of the Development Committee submitted our first grant! Cross your fingers! Kristin Ebeling, Seattle Chapter Director has got three solid program partnerships with local indoor skateparks: Innerspace, Bellevue Indoor, and Skatebarn. She is also working with Japanese Cherry Blossom Festival (April) and Children's International Festival (May) to have demos. Kristin is also leading the way on a volunteer group that is making Skatebarn a better place for girls to skate! Jessie Haungs, Portland Chapter Director is continuing the Dept of Skateboarding clinics every last Sunday of the month, and working towards stronger partnerships with YWCA, Portland Parks and Rec, and Windell's! Erica Harris, San Francisco Chapter Director is working in collaboration with the San Francisco Skateboarding Association, and Skate Club. We are developing a board, and currently drafting a 5 year strategic plan which we will begin to implement in 2011. 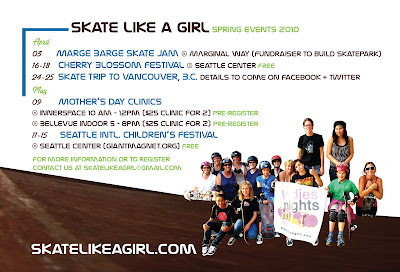 If you are interested in supporting or partnering with Skate Like a Girl in 2011 (or sooner, please contact us). Looking for people to sit on Skate Like a Girl Committees: Programs, Development, and Risk Management. Are you a business owner and would like to get the word out to a family or female audience? Help sponsor programs with in-kind or financial contributions, email us! We look forward to 2010 with your support! Skate Like a Girl Seattle Programs Feb - May 2010! Check it out! Seattle Programs Feb- May 2010! Big thank you’s for everyone who made it out to Skate Like a Girl’s 2nd annual Wheels of Fortune. We had over 30 contestants from all over – the US, Canada and one Swede skate for over $1000 in cash and prizes. Save the date for WOF 3! December 17 – 19. 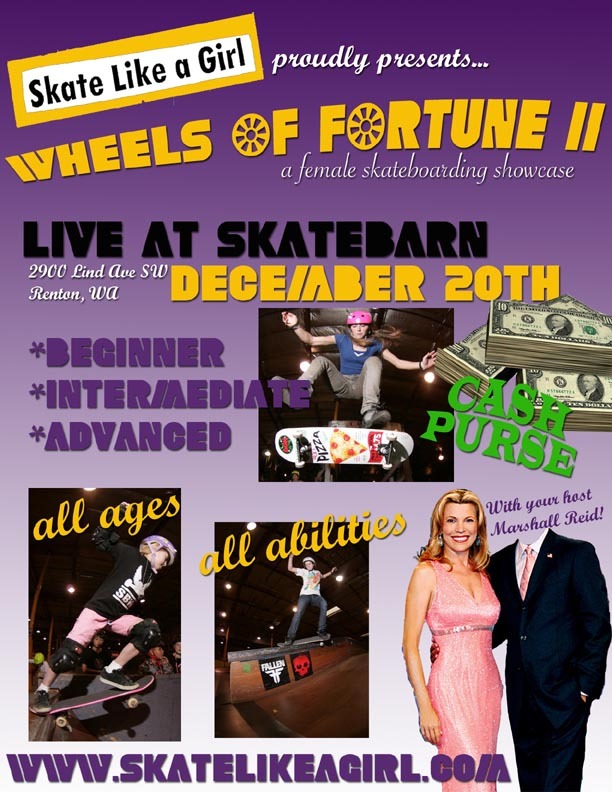 If you are interested in sponsoring the event, please contact us: skatelikeagirl@gmail.com. play.me sponsors Wheels of Fortune! Good news everyone! Our friends over at the fresh new music site Play.me (www.playme.com) will be sponsoring Wheels of Fortune II! Show them some love and check out their new music service, where you can stream ad-free unlimited music, download MP3s, share playlists, and take songs to-go on your iPod or mobile phone. We have some promo codes to giveaway too, so ping us if you want free MP3s! Just mention “I want my Play.me” to skatelikeagirl@gmail.com and we’ll send you a code. Enjoy the music! Listen to millions of songs on Play.me and download your favorites! Artists include: Lady Gaga, Passion Pit, Vivian Girls, Matt & Kim, The Clash, Rihanna, Sonic Youth, MIA, Phoenix, LCD Soundsystem, 50 Cent, Yeah Yeah Yeahs, Michael Jackson, TV on the Radio, and so much more! Thank you for an amazing year in 2009! We are wrapping the year up with Wheels of Fortune II at Skatebarn on December 20, 2009 from 11 – 5pm. This is the largest girls contest in the Pacific NW! Please do come and show your support for female skaters! The event is FREE to watch. Or better yet, register to skate in this all ages, all abilities contest! Thanks to families and businesses for donating money, we will have a historic $1000 purse for our contestants this year! In addition to SLAG Seattle, both the Portland and San Francisco chapters had a busy year starting new summer camps, partnerships, putting out Hate On This (a girl only zine), and much more! Snowboard Connection, Manik, Nomadic, Play.me, DC, Fallen, Anti-Social, Creature, Indy, 5boro, Nikita, Evo, Parents for Skateparks, Seattle Skatepark Advisory Committee, Bellevue Skateparks, Bootyland, Whole Foods, Les Skirtboarders, Skater Girl UK, Ugly Girl, 52 Skateboarding, the Manitoba Skateboard Coalition, Fuel Coffee, the Vera Project, Seattle Girls School, Highline Big Picture School, bloggers supporting SLAG, great press from Real Change, NW Colors Magazine, NW Asian Weekly, and of course all of the SLAG volunteers! We are looking forward to 2010, which is also the 10th Anniversary of the first clinic put together by co-founders Fleur Larsen and Holly Sheehan as part of the 1st Lady Fest in Olympia, WA. Want to be part of 2010? Do it through volunteering! Email us if you want to donate, partner or sponsor Skate Like a Girl programs in 2010. Skate Like a Girl presents Wheels of Fortune part deux, the biggest skate contest for the ladies in the Pacific Northwest! Cash prizes for advanced riders. Seattle, Washington (November 26, 2009) – Skate Like a Girl presents Wheels of Fortune part deux (WOF2), an all-girl skate competition on Sunday December 20th at Skatebarn in Renton, WA. (http://www.skatebarn.com/). Last year was a smash, with over 30 girls signing up. Winners of the advanced division were Amy Caron (1st Place), Kristin Ebeling (2nd) and Tamara Drybrough 3rd). WOF2 will take the same format as last year. Girls only clinic at 12PM leading into the Wheels of Fortune street contest, with 3 divisions (beginner, intermediate, and advanced). This contest is designed to be a fun and low stress jam. Thanks to the generosity of families and individual supporters WOF2 will have over $1000 cash purse for the top three advanced skaters and winner of the ramp jam. If other individuals or businesses would like to help grow the pot and be part of this historic cash purse for Northwest female skateboarding, please contact Nancy Chang (skatelikeagirl@gmail.com). WOF2 will be emceed by Seattle grandmaster of skateboarding: Marshall Reid of Manik Skateboards. Other exciting features of the contest will include raffles, and live painting and art show with local Seattle artist onesevennine (http://179ers.blogspot.com/) and special guests curated by Shaina Folely. Skate Like a Girl will offer a one hour beginner clinic open to girls and women. The clinic will teach the basic foundations of skateboarding: board control (balance, pushing, cruising, stopping, and turning). For those that master board control, the clinic will work with those skaters to get the feel of riding ramps, and an introduction to simple flat ground tricks (ollies, shuvits, boardslides, kickflips). The clinic starts at 12PM sharp, all participants must come at 11:00 AM to check –in. Those with skateboards and safety gear are encouraged to bring them. Skate Like a Girl will have gear for those who don’t own their own. Those who participate in the clinics are encoraged to skate in the beginner category, and will not have to pay the entry fee. Spaces are limited so please pre-register to gurantee a spot. All participants must fill out all release forms before contest. Under 18, parents/guardians must sign off forms. Helmets are required! We are proud to be sponsored by businesses, families and individuals who are helping to support female skateboarders. With out these sponsors we wouldn’t be able to throw such a big event. Please take time to check them out online. Uptown Skate School is helping out with Where the Ladies At! So Jennifer from Uptown Skate School emailed a few days ago, and she is helping with getting some product for the event. We checked the weather forecast, it calls for some rain. : ( Make sure to follow us on twitter @skatelikeagirl for a plan b.
Labels: NYC, Where the Ladies At? Kristin, Kim, Susannah and I (nancy) hung out with over 50 girls this Saturday! We taught about 30 girls to skate at Miller Community Center! Thanks Sno Con for the goodies for the girls. Skate Like a Girl Fall Programs! Ok summer in Seattle is officially over. We are fully ready to take on fall skateboarding! 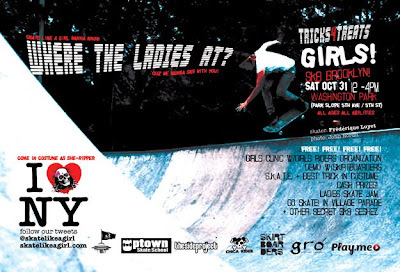 Seattle crew will be heading out to NYC for Halloween to skate and to find out: Where the Ladies At! It should be a blast, we will tweet about it. We will come back and launch fall programs! Carrie and Kristin have been making friends all summer at Ladies Night at Sea Skate, and we are hoping all of our new and old friends will join us to for Ladies Nights indoors at Skatebarn every Wednesdays 6-9pm and thanks to Skatebarn we can skate for FREE! There will not be any formal instructions, unless you coordinate with us in advance. The first one will be November 4th! This also happens to be Nancy's birthday, and she has promised tamales and a pinata! It's going to be so fun! 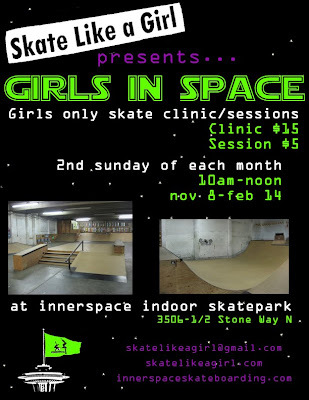 If you are looking for clinics, we will be at Innerspace for GIRLS IN SPACE, every 2nd Sunday 10-12pm. This will be girls only. $5 for drop-in skate, and $15 for clinics. Email to register for November clinics: skatelikeagirl@gmail.com. Junkies broke into the SLAG office. Frankie's taking care of our broken window now. Where the Ladies at! NYC? 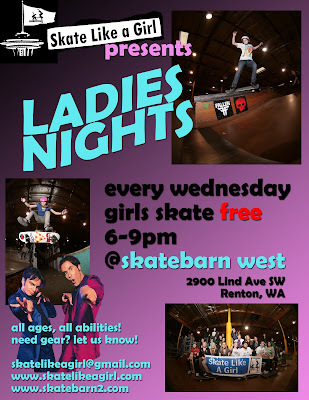 Skate Like a Girl presents Where the Ladies At! in partnership with the Skirtboarders and Girls Riders Organization. Seattle, Washington (September 30, 2009) – Where the Ladies At! 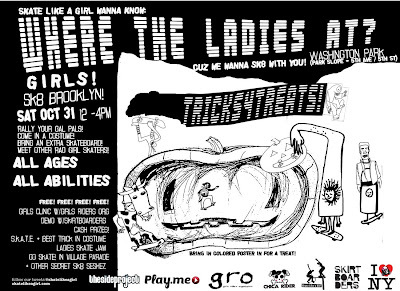 Skate Like a Girl is teaming up with Skirtboarders and Girls Riders Organization to have their first event in New York: Tricks4Treats, a fun day of skateboarding! This event is free and open to all ages and abilities. Skate Like A Girl will be offering free instructional clinics at 12pm to girls and women of all-ages on skateboards provided courtesy of Girls Riders Organization. In addition to the clinic, we'll have the Skirtboarders from Montréal demo! Confirmed Skirtboarders are Frédérique Luyet, Anne-Sophie Julien, Mathilde Pigeon, and more! Exciting new music site, Play.me (www.playme.com) will be sponsoring a game of S.K.A.T.E. and we will be scouting out who’s got the best trick in costume, and treating them with some cold hard cash courtesy of Play.me! After 4pm we will be rallying folks skate in the Village Halloween Parade! Follow-us on Twitter @skatelikeagirl for our weekend updates—where we are going to skate, and just in case it R.A.I.N.S. – where we will be at! FREE Clinic: First come, first serve! Clinic starts at 12pm sharp. Skate Like a Girl will offer two one-hour clinics. For those without skateboards, gear will be available to be borrowed, courtesy of Girls Riders Organization. The first clinic will teach the basic foundations of skateboarding. By the end of the clinic participants should be able to have board control: balance, pushing, cruising, stopping, and turning. For those that master board control, the clinic will work with those skaters to get the feel of riding ramps, and an introduction to simple flat ground tricks; ollies, shuvits, manuals, kickflips and other tricks. The clinics will be taught by Nancy Chang (from Seattle and 2008 L’Oreal Paris Women of Worth for her work with Skate Like a Girl), Susannah Young (from Sweden) and Lanna Apisukh (Brooklyn Local). The clinic is free, but a suggested donation is $20 to help support Skate Like a Girl and Girls Riders Organization programs. Those with skateboards and safety gear are encouraged to bring them. Girls Riders Organization will have gear for those who don’t own their own. Spaces are limited to 20 per session, so please come early! Play.me knows that girls are shredders and is putting up a little pocket money for a game of S.K.A.T.E and the Best Trick in Costume! Girls who can dazzle the crowd will get $50! Play.me is the best new music destination where you can legally download free MP3s and stream ad-free music content from your computer, your favorite social site like Facebook, or your mobile phone. Without Play.me we wouldn’t be able to give out a cash prize, so please support them by visiting www.playme.com where you can listen to millions of songs and download your favorite tracks. Skirtboarders is a skate crew from Montréal! They skate hard, film and are fun gals. Skirtboarders mastermind Mathilde Pigeon put out Les Skirtboarders an all girl skate movie in 2007. We are all about ladies doing it for themselves, and les Skirtboarders are dominating making paving the way for girls skateboarding! The Side Project is the best girls skateboarding network providing female skaters all over the world with THE online place to go to get footage and news on female skaters. The Side Project is run by Lisa Whitaker-- one of the biggest pillars of girls skateboarding! We are proud to have the Side Project as a media sponsor. Chica Rider is the Latin American version of the Side Project, run by Paloma Guerrero. Chica Rider organizes events, tours, and support female skaters with opportunities to excel in skateboarding. The site has amazing photos and skateboarding news in both Spanish and English. They are working hard to represent the she-rippers of Latin America. We are lucky to have Chica Rider as our media sponsor! Girls Riders Organization (GRO) is a nonprofit group launched in 2006 on a mission to inspire, educate and support girls in action sports. Touring the country bringing nonexclusive events and opportunities designed for females by females to more girls coast to coast to anyone. All girls, all ages and all skill levels are encouraged to participate. GRO strives to make skateboarding more accessible, providing equipment, experienced instructors and a safe and positive environment. We are excited to partner with them to provide clinics. Skate Like a Girl is a nonprofit based in Seattle, with two chapters in Portland and San Francisco, with a mission to promote female skateboarding by fostering confidence in girls & women to skateboard and take leadership in their communities. We love organizing events and meeting up with other girls who skate! Olivia says bahhhh to the water puddles at Sea Sk8! Aug 31, 2009- 501 c 3 application in the mail!